Technology is a big part of everyone’s life these days. That’s why it’s crucial to have an online presence for your business and online marketing should be high up on your priority list. More often than not, your website is the first contact your potential customer makes with your business. What message would your current website portray right now? Having a bad design or an outdated website will give visitors the impression that your business isn’t professional and that you don’t offer quality products or reliable services. If that’s what you’re going for then great, keep it that way. If it’s not, read further. By hiring a professional online marketing specialist, you’ll be able to make a good impression on visitors. You have exactly 3 seconds before they lose interest – 3 seconds! 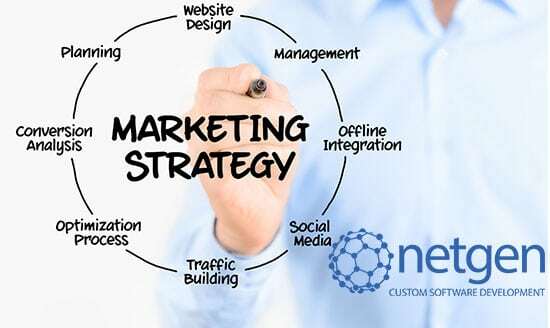 Luckily the experts at Netgen knows how to capture your target audience because they have a strategic plan put in place long before your website is even developed. When you hire Netgen for your online marketing, you will have the freedom to focus on running your business while they take care of marketing your brand. Being market leaders in the industry, the team has the experience needed to produce results quickly, efficiently and all this at an affordable rate. Their services aren’t limited to online marketing either. They also offer mobile application as well as custom software development to help your business function at maximum potential. Take your business to the next level the easy way! Give Netgen a call today!